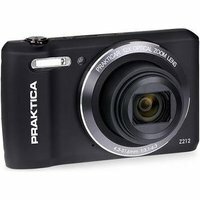 Featuring a powerful optical zoom, PRAKTICAs Z212 allows you to capture crisp images from far and wide with its 20 megapixel sensor. The new creative mode allows you to capture images even in low-light conditions. Wirelessly share your photos in moments on social media using the in-camera function and never miss a moment with the slim, sleek camera.